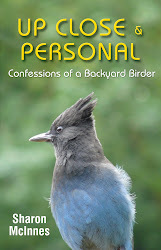 If you live on Gabriola Island you already know that I write a monthly column called Just for the Birds for The Flying Shingle, our local newspaper. But I've discovered that, thanks to the world wide web, many people from much farther afield often read this blog. (What can I say? Birders are everywhere!) So I'm going to post a link to my column each month, starting today. This month's article is about a flock of "goldies" that came to visit our yard for several days in early May. To read it just go to http://www.flyingshingle.com/ then click on Columns and scroll down to the heading Just for the Birds. June Birds and their babies!